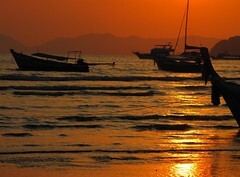 Most folks with an active pulse have heard tales concerning Thailand’s picturesque islands. Problem is, these tales aren’t â€œtallâ€ and for that reason, the sandy islands beneath stunning karsks are flooded with tourists clamoring for their corner of paradise. Of course, these stories of wonderment drew Ash and I to see for ourselves. Eleven days in incredible India made even these grizzled backpackers desiring a cold beer, a cleanish room, and a clear head. Not so fast. An overnight flight from New Delhi to Bangkok, a four hour layover, a short hop flight to Krabi Airport, and a ninety minute bus ride later, we arrived in Ao Nang on the Andaman Sea. We found it as advertised… stunning, but so did thousands of others. Ash rested after her sleepless night while I opted for a sunny nap on the nearby island of Koh Poda. Returning at sunset, I roused the drowsy Ash for the sunset that seemed to melt the bobbing longtail boats in the natural harbour. 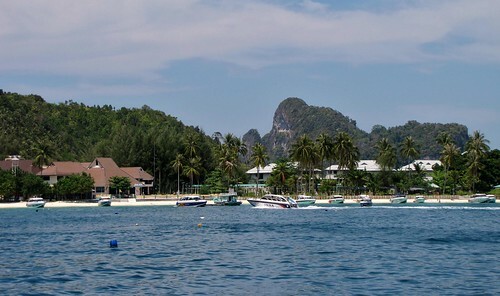 Three negotiating sessions yielded an attractive price for a full day of island hopping including the acclaimed Koh Phi Phi the following morning. Despite the live music of Ao Nang rocking until 4am, we managed to feel rested as we boarded the powerful outboard speedboat at sunrise. If I weren’t awake yet, Monkey Bay sure did the trick, what with its teeming water of medusa jellyfish. With our guide’s assurance that the stings aren’t too bad, 10% of the boat’s patrons found ourselves dodging the translucent ocean beings rather than snorkeling. In fact though, the stings felt like more than pin pricks, hundreds of pin pricks in the span of fifteen minutes. Next location on our whistle stop tour was the famed Maya Bay on Koh Phi Phi. The Beach turned this ridiculously beautiful locale into a zoo of tourists. As the boat powered down making the turn into the secluded bay, the focus of our engaged eyes fought valiantly between the amazing sight and the rows of speedboats, longtails, and densely populated white sand. To make the most of the experience, we waded out into the bay until Ash could barely stand. Here, Maya Bay felt void of the rabid holidaymakers. After short stops at Pi Ley Bay and the Viking Cave, the speedboat’s bow nestled into the white sand of Phi Phi Don where we dined on a surprisingly delicious lunch. Having ate our money’s worth, Ash and I took a leisurely walk around Phi Phi Don, a completely restored island after the devastating tsunami on December 26, 2004. 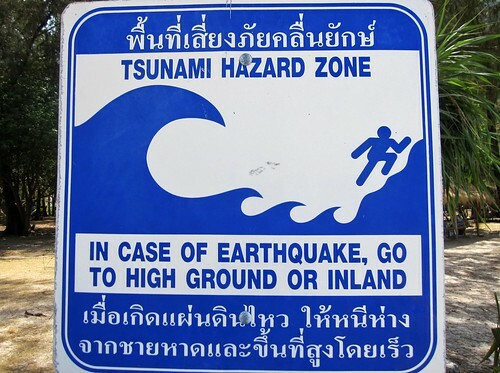 Every Thai island now has clearly marked tsunami evacuation signs in case of an earthquake. However, the low lying nature of Phi Phi Don coupled with its beautiful yet terrifying attribute of having the sea on two sides demonstrates its vulnerability. 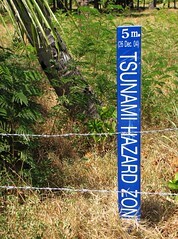 In fact, a simple blue post displays how deathly high the water rose on that fateful 2004 morning. Three minutes and three powerful waves later, the entire island was nearly destroyed leaving 700 dead. With much of the island rebuilt, Ash and I could only look at post tsunami images to understand the gravity of the tragic event. Back in the speedboat wondering what must have crossed the minds of those caught in nature’s fury, we arrived at Bamboo Island for some lounging before a late afternoon open water snorkeling session at Hin Klarng. Suitably worn out after a sensational day island hopping, we hung around Ao Nang for yet another terrific sunset. Fed up with the tourist feeding frenzy of Ao Nang, we hopped a ten minute tuk-tuk and met up with my good buddy from college prep school, JRob, at Dawn of Happiness. This secluded and uber cheap beachside bungalow was perfect for the next two nights. 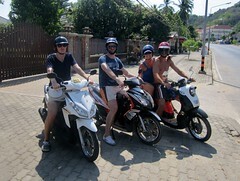 We arrived just as two of the four vacationers from Shanghai bid adeiu to â€œthe land of smiles.â€ Taylor, JRob, Ash, and I rented scooters for an afternoon of cruising the coast line. 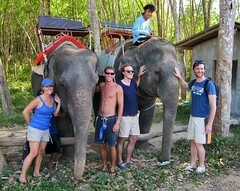 On aÂ Thai backroad, we happened upon a local company offering rides on their proud elephants. JRob and Taylor climbed atop Thophaothong after Ashley and I were welcomed on Singjai’s back as we rumbled through a rubber tree plantation. Singjai was a well behaved elephant while Thophaothong acted up by grabbing anything he could eat with his powerful trunk. After a relaxing night in the secluded Dawn of Happiness, we chartered a private longtail boat and headed for Chicken Island. 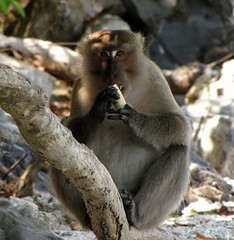 Though the island has no chickens, it does feature clever monkeys. While some poor old sap was cooling off in the blue sea, one such rogue devil snuck in amongst the foliage and snatched his sandwich and banana. Having spent three hours in a cloistered area of Chicken Island, the tide had moved against us requiring a twenty minute chest high wade through the surf to reach our transportation. 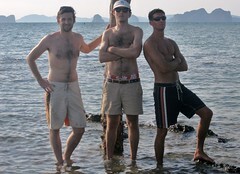 After a snack stop at Railay Beach, we arrived back at home base and showered up for a night to remember. Na, the genuine proprietor of Dawn of Happiness, offered to accompany us to his favorite karaoke establishment. The cover charge? Join him in taking a shot of his â€œhome made whiskey.â€ Whiskey me thinks not. It was a jar of cough medicine, water, and who knows what. Not wanting to be rude, we congratulated Na on his skills in creating the worstÂ spirits everÂ and headed for the singing spot, gagging all the way. The record literally turned off as the four white folks waltzed into the local saloon. Ten minutes lates, JRob and Taylor were perched behind the computer selecting hits from the 80′s. Extreme, Elton John, Chumbawumba, and the late Michael Jackson were all burned down. Serenades, group sing-a-longs, and peculiar dance moves were all part of the act. Ash’s duet with an adorable elderly Thai man topped it all off. Despite the accommodating waitress ensuring our mugs were filled to the brim with Chang beer, our bill after three hours was laughable. 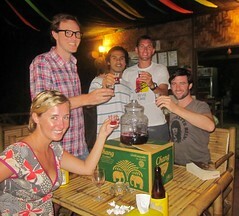 It was a great night with local Thai people who were more than happy to share the microphone. The tales of Thailand’s beauty are not overblown. Discovering it for ourselves proved worthwhile. 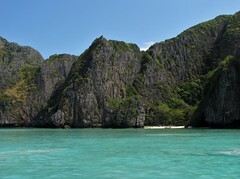 1) Koh Phi Phi’s Maya Bay is certainly worth a visit, despite the throngs of people. 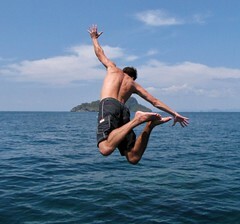 You could opt for lodging on Koh Phi Phi and avoid the touristic times. 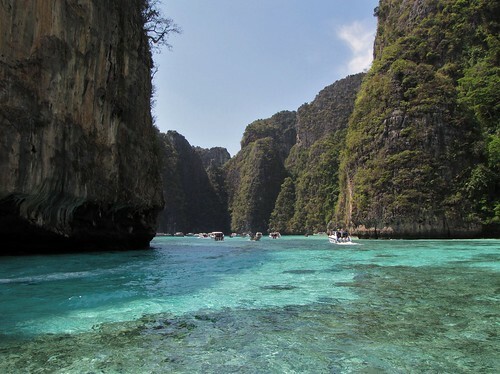 Or when securing a boat trip, select one that visits Maya Bay first or last on its list of stops. 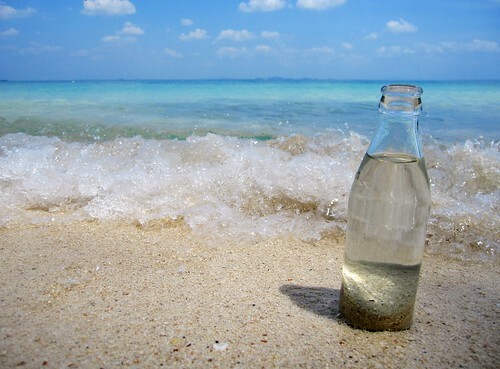 2) The Thai islands and coast in the Andaman Sea are strewn with small bungalow retreats. Determined Internet mining will yield a cheap and beautiful bungalow that you can call your own. Taylor – Ni hao! Now that song is a jam. Just listening to it makes us lust for cough medicine “whiskey.” Pause. Not.